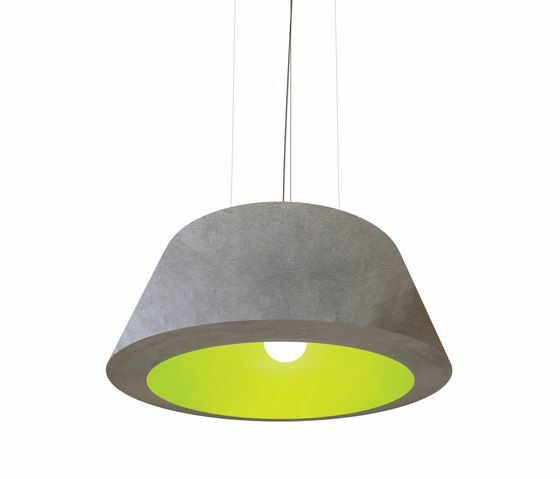 Skirt Available as suspension lamp and currently available in two standard diameters and 7 colours. The material fiber glass, the exterior is smooth silk in black or white. The inside standard colours are Fuchsia, gold, gold leaf, lime-green, orange, white and red. The handcrafted Skirt is characterised by its conical shape. Skirt - Cup Available as suspension lamp. Made of fiberglass the exterior texture ‘concrete look’ inside colours: fuchsia, gold, gold leaf, lime-green, orange, white and red. The handcrafted Skirt-Cup is characterised by its unusual thickness and dome like inside as opposed to the conical exterior shape. Skirt - Top Available as suspension lamp and currently available in two standard diameters and 7 colours.Material: fiber glass and an exterior of smooth silk in black or white. The inside standard colours are Fuchsia, gold, gold leaf, lime-green, orange, white and red. The handcrafted Skirt-top is characterised by its conical shape. The light flowing from the center of the Skirt lamps creates a warm lighting atmosphere. Kunstlicht translated from Dutch to English means Artificial - light.